1 Federal Census, IL, Cook County, 1910, Chicago, Ward 13, ED #647, Sheet 1, Image 1 of 24, Ancestry.com (Online Census Images). 2 Federal Census, IL, Cook County, 1940, Chicago, Ward 48, Block 16, ED #103-3056, Sheet 2A, Image 3 of 24, Ancestry.com (Online Census Images). 3 Illinois, Federal Naturalization Records, 1856-1991, Petition for naturalization for spouse Armando Tejada Urquizo, Ancestry.com (Online Database). 4 The National Cyclopaedia of American Biography, Volume 17, New York: James T. White and Company (1920), 9, Google Books (Digital Library). 5 U.S., Cemetery and Funeral Home Collection, 1847-2018, Death record for Josephine Esterly, Ancestry.com (Online Database). 6 U.S., Social Security Applications and Claims Index, 1936-2007, Claim record for Josephine Hall Esterly, Ancestry.com (Online Database). 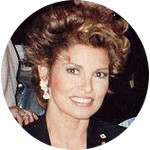 7 IMDb, "Biography for Raquel Welch", (accessed 02/05/2013). 8 Wikipedia, "Raquel Welch", (accessed 02/05/2013).